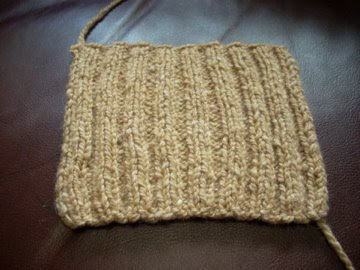 As promised, here's a bit of knitting to show you all. I swatched for Franklin (my brother's sweater) and really loved working with the yarn. The silk and cashmere in the Jo Sharp Silk Road DK Tweed (oh man, what a long name!) definitely makes this yarn soft and luxurious, but the tweediness and slightly bumpy texture, along with the little bits of VM that keep falling on me, gives it a sort of rustic feel as well. It's like the best of both worlds! It's also very light, but very warm. 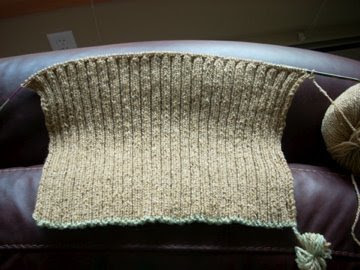 I was supposed to measure gauge with the ribbing stretched. So I stretched it until I got gauge, no more, no less. I was happy with that, so I started on the back of the sweater. That's about what I've got so far (and by "about", I mean it is). 9" of 2x2 rib, and I'm not bored yet! Last night I also worked on Delain a bit because I wanted to get him all put back together. 13 and 1/2 inches of the front, only 4 1/2" to go before I can split for the neckline and begin the armscyes (is that the proper plural of that word?). Tomorrow: Tour de Fleece! I finished my skein and it is beautiful if I do say so myself (feel free to disagree tomorrow). You're really on a sweater roll! 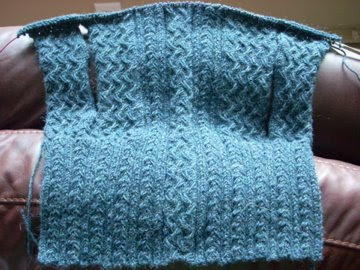 Lovely stitch pattern on Delain, have fun with all that ribbing! Oh, I have some of that silk road in my stash and you're making me want to pull it out! Both projects look wonderful. Your Delain sweater is coming along really nicely. The yarn looks a lot lighter in the photos though. Is is really that light? Fantastic progress! Both look great. I'll bet your brother will love his sweater when it's done! Jealous of your knitting progress. Love what I see!